[Editor’s Note: The following words are the contributions of Adorabully and Marv E. Lust, skaters from Salisbury Roller Girls I was capturing during the 2015 edition of East Coast Derby Extravaganza. Salisbury based in the state of Maryland made quite an impression after their first representation as an all-star team at ECDX. Adorabully and Marv provide their point of view of the current #104 ranked league in WFTDA. Adorabully starts with the background to Salisbury and Marv continues on. 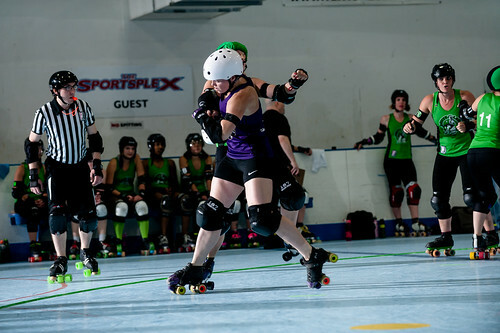 Founded in 2010, the Salisbury Roller Girls have steadily evolved since its inception. The initial group of aspiring skaters have developed into an organization of over thirty dedicated female athletes. 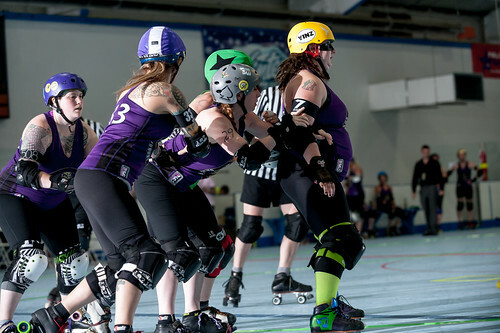 Since SRG’s first bouting season in 2011, they have proven to be an unstoppable derby force. The league consists of two teams, the All-Stars (WFTDA since 2013) and the Wicomikazis. In 2014, the All-Stars hard work and dedication was rewarded with an undefeated derby season. SRG is committed to empowering not only its own skaters by providing a positive and competitive atmosphere, but also supporting the community in which it calls home. The Salisbury Roller Girls feature and bring awareness to local charities and businesses during home bouts and throughout the year. SRG also provides a positive learning environment for its newer junior roller derby team, the Old Bay Bombers, ages 8 to 17. Salisbury’s current season is no exception to its evolutionary history, fighting hard in the WFTDA rankings and skating for the first time at ECDX and leaving with a 2-0 record and a record of 5-1 for the year. It was our first ECDX experience as a team playing on that track. We were very excited, nervous, and anything else you can imagine! We stuck together, put everything out on the track and proved who we were. As far as a derby community, we’re it! The next one is about an hour and some change away in Delaware. I jump at any opportunity to skate. I try to get to as many scrimmages as possible. I participated last year as well. The first half was regular derby, then the second half was shenanigans! We were told some things and others we would just make up and see what would happen. I had a great time! What sort of town is Salisbury? Salisbury is definitely a college town so we try to gear towards the younger crowd. We are always at events around town, art crawls, guest bartending, local concerts. We support giving back and believe we need to make a strong appearance in order to get our names out there. Salisbury is not a feeder league. We have actually recruited more people if anything. We acquired two great jammers from Southern Delaware, and a phenomenal player from Jacksonville, and another solid blocker from Arizona. People move here for family and end up with us. Charm City is 2 hours away, which would really be the only other WFTDA league in consideration. We had one girl transfer to Charm but only skated one season I believe and retired. We have great retention. For instance, I would say 8 of the 13 all stars have been there since the beginning. Along with some Wicomikazis who have been there at least two to three years. We have 5 main coaches who alternate nights. They’re usually the ones going to places like North East Derby Convention, the conventions that are centered around coaching and learning. As I mentioned I go to as many scrimmages as I can. Aside from wanting to play as much derby as possible I enjoy them to learn new things. We encourage everyone to speak up if they find a different way to do something in a drill. I knew we were strong and played well together, but ECDX really solidified that thought. We went out there to win and made them play our game. Just like any time there were moments where we needed to get it together. Moments before the start of our second game a key player was injured. That really pushed us to win. I do think hivemind exists. You become so in tune with your teammates that you don’t need words. Sure, we still yell plays but we know what works and how to fix it if it isn’t working. I think there are definitely different strategies that work for different teams. We know what we need to so to execute a play but if the opposing team is countering that strongly we know how to combat it. But that doesn’t mean it will work for a different team. We could switch plays with another team and still tweak what they do same as what they’d do with our plays. The game is constantly evolving which is what makes it so amazing. Salisbury was just steps away from making D3, but there’s next year. Thank you so much Marv and Adorabully! The next bout for the red hot All-Stars from Salisbury is July 18th against Garden State. The next home dates afterwards are with Lehigh Valley September 26 then a feature rematch from ECDX against Connecticut October 4. For more information about SRG click here at Salisbury Rollergirls.